Fresh, homemade pasta always intimidated me but I've been wanting to try it forever. Well, for a few months at least. Anyway - I came, I saw and I kicked it's a$$! Why I was afraid of this I have no idea?! It was so easy and tasted fantastic. AND - I was making this without a pasta roller and it was still that easy. Honestly though, I could not get over how great the fresh pasta tasted. I've always been able to bake great Pasta/Italian dishes but there was always something holding it back from making it taste phenomenal... apparently it was the pasta itself. I'm not saying that I'm going to make fresh pasta everytime I want Spaghetti now, but for canneloni, lasagna, ravioli, etc. I think I may more often than not. Those are meals we typically have on the weekend because they're more time consuming anyway so I may as well spend an extra 20 minutes (not including the dough rest time). It'd totally be worth the effort! I will say one thing though - if you're intimidated by it, trust me - once you try it once you'll anxiously await the next time you have a little extra time on a Sunday to make fresh pasta again! The pictures are not mine - my hands were too gummy to take pictures, plus, I figured my pictures would not do justice to the pasta! Maybe next time I'll be more prepared and ready to take pictures! - once eggs and flour are mixed a dough should start to form. If TOO DRY, add water sparingly to get the right consistency. If TOO STICKY, add flour sparingly to get the right consistency. - Once dough is formed to right consistency knead by hand for 10 minutes until smooth and elastic. - Thickness of pasta sheets will depend of pasta shape desired. 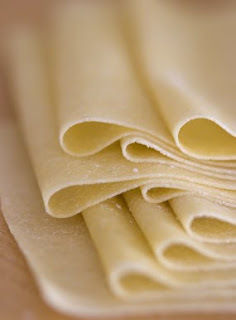 For strip pasta, such as fettuccini, roll to about 1/8" thick. 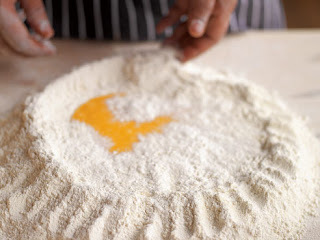 For sheet pasta, such as lasagna or ravioli, roll thiner - until you can see your hand under the dough. - Cook in salted boiling water for 1-4 minutes, depending on thickness of pasta sheet. REMEMBER, fresh pasta takes significantly less time to boil than boxed so don't stray too far. For larger sheets you may want to boil in batches, using a spider skimmer to remove the cooked noodles. I love freshly made pasta and I'm actually teaching a class next month on it! Thanks for sharing!